The president’s statement on November 20, 2014 contained several outright falsehoods. More significantly, masked behind the discussion over prosecutorial discretion is a flagrant violation of the Constitution’s core separation of powers principle that Congress, not the president, makes the law. First the lies, damn lies, and statistics. 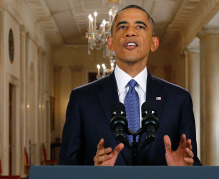 President Obama said that deportations are up over 80 percent. Truth be told, his administration has manipulated the definition of “deportation” in order to make that claim. Those caught and turned away at the border are now included in the total, whereas before they were not. Comparing apples to apples, the Los Angeles Times reported last April that deportations are down by more than 40 percent since Obama first took office, and the New York Times reported that there was a 26 percent drop in deportations in fiscal year 2013 alone.